Lock in a great price for Hostel La Posada – rated 8.2 by recent guests! Very nice, friendly staff that continuously worked to keep the place clean from dust. The dining area was well kept, as was the cooking facilities. Pool table, really nice music, I especially like to fall asleep listening to the sound of happy people chatting late at night, so for me this was a perfect place. Great staff - friendly and helpful. Wonderful breakfast! It looked great when we first got there. The Pool was great! For the low price and a hostel, the La Posada is very nice. It‘s perfectly situated and nevertheless quiet enough for a good sleep (save for the neighbours dog, who likes to bark, but we didn‘t mind that). The little terraces with hammocks are nice to relax! The property is nice and well kept. There are tables, hammocks, and day beds to relax on. Breakfast is good and the staff was kind and helpful. Nothing except the beaches - which has nothing to do with the hostel. Super nice staff and atmosphere. The hostel has everything you need including pool, couches, bar and free breakfast. The dorms are clean, comfy and have private bathrooms. One of our best sellers in Santa Teresa Beach! 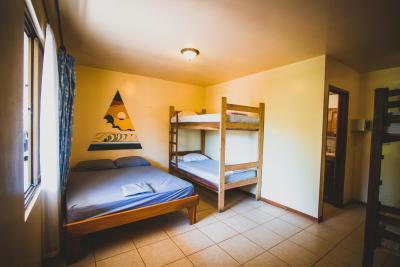 Hostel La Posada is located 4 minutes’ walk from Santa Teresa Beach and 3.1 mi from Cabo Blanco Nature Reserve. It features free WiFi in all areas. The property offers private rooms and shared dorms. There is a pool table at the property and enjoy cooking in the fully equipped shared kitchen. Activities as surf lessons, canopy tours, ATV rental, sport fishing and visits to the Turtle Island can be arranged at this property. This hostel is 100 feet from a bus station and 12 mi from Montezuma Town in the Gulf of Nicoya. When would you like to stay at Hostel La Posada? 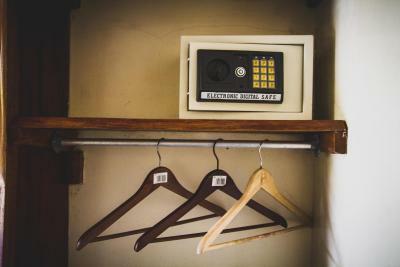 House Rules Hostel La Posada takes special requests – add in the next step! Hostel La Posada accepts these cards and reserves the right to temporarily hold an amount prior to arrival. Great staff. Location. Good Value. Unfortunately the AC in our room did not work well, it was quite warm and humid. pool = hot, wrong informations about buses at the front desk, toilets are not working, rooms are very hot alsonduring the night so they put 4 fans in one room for 6 people, they would also have an AC in the same room, but they don't turn it on because they say it's more expensive then 4 fans in a room running all night all day long.?! staff smokes marihuana all day long. some of the front desk personal was really nice, thank you for that. I think there is free yoga lesson every day but I didn't tried. The breakfast is a pancake with 2 fruits every day. Horrible stay at this hostel! When I arrived (before the check-in), the girl told me she was gonna give me my room even though the housekeeper hadn’t come yet. So I was pretty impressed. So she assigned me a bed (the bottom one, which I was really happy about).. so far, so good. I went to the beach, all peaceful, I come back and someone has put all their stuff on my bed... so I got stuck with the top one near the window. Then, I go out for dinner, I come back and there’s no water... everywhere in the hostel... the next morning, still no water. Apparently all the town is out of water... strange enough, the restaurant I went to (2 min walk) had water!! Oh and wifi never works unless you’re in the reception. A/C doesn’t work either and it’s HOT as hell in the room. Then I ask the girl for a shuttle to Tamarindo, she says I can book tomorrow with my credit card.. I come back the next day and another girl tells me it’s cash only. Nobody knows anything in there. The bed is hard as a rock, pillow (what pillow!!) and did I say it was HOT?!?! I would NEVER go back there. It’s really expensive and even if it was free I wouldn’t go back! Couldn’t wait to leave that place. Everything else was awful. Especially the very rude staff (apart from reception girls). Did not make you feel welcome and resented you being there. Don't stay here expecting to get any sleep. There is a kitchen but limited pans etc to cook with. Not good for surfers as they don't like you being wet any where in the hostel. The communal area plays loud music all day and night and random people sleep on the sofas in the communal area and were shagging there one morning when I got up for a surf. Will never recommend or go back. I know it's a hostel and hostel prices but this is the worst I've stayed in. Security is also questionable. The internet is also awful and generally didn't work- not helpful when you are trying to book somewhere better to stay. Hardly any internet connection in the rooms, a pretty bad one at the reception. No soap in the shared toilets. The beds were horrible, just like you were sleeping on the floor. The kitchen was unfortunately not clean and therefore not a pleasure to use. Swimming pool smelled quite bad.. Furthermore, I wouldn't say it's a good place to meet new people. The location is great, just 2 minutes from the beach. Also there is a supermarket just around the corner.